BlackRadioIsBack.com New Music: Trae the Truth | BlackRadioIsBack.com - Official Blog of the Syndicated FuseBox Radio Broadcast! I felt the need to shine a bit of the spotlight on Southwest Houston's own (and also Screwed Up Click and the ABN Gang member) Trae the Truth, especially with this upcoming Streets Advocate Mixtape dropping on November 11th all over the place. The first time I personally heard this brother on the mic was relatively late in his almost decade-long career through one of my southern connects, on the 2007 release of the Life Goes On album. Pretty much right after that, I started copping more of his regular releases (Restless and The Truth Show are pretty dope as well), his mixtapes and checking for the bro on other artist's releases. Besides having crazy skills, good ear for beats & production along with the ability to get folks amped (always a good thing), Trae gives some of the most direct (whether you agree with him or not) and therefore real interviews and music of a great deal of these so-called Street Hip-Hop artists. 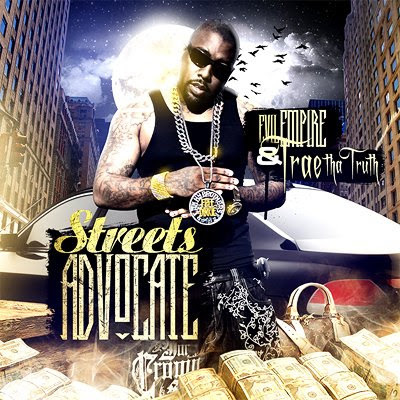 We have a couple of tracks from the Evil Empire & Trae The Truth - Streets Advocate Mixtape for folks to cop a free download of as well as a few of Trae's videos (straight up, NSFW to blast off on the speakers without getting a side eye or worse on the language end) to get a feel of where folks are at - hope you enjoy!